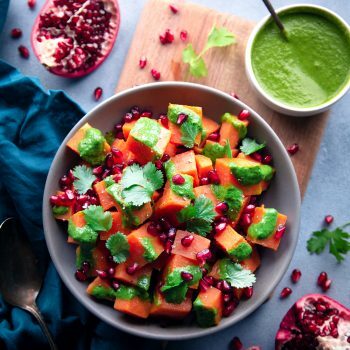 Tender diced sweet potatoes blended with Indian spices and topped with cilantro-mint chutney and pomegranate arils! The perfect side for any meal! Recipe reprinted with permission from Vegetarian Indian Cooking by Manali Singh, Page Street Publishing Co. 2018. Add 1 cup (240ml) of water to the inner pot of your Instant Pot. Place the Instant Pot's trivet inside and then place the sweet potatoes on top of the trivet. Close the lid and then press the manual or pressure-cook button. Cook on high pressure for 15 minutes with the pressure valve in the sealing position. Let the pressure release naturally. Open the lid and carefully remove the sweet potatoes from the pot using tongs or gloves. If you use tongs, the skin of the sweet potatoes might come off in a few places while you are lifting them out, so be very careful when lifting them up. Let them cool down a bit, peel, and then diced. For extra flavor, you may toss the diced, cooked sweet potatoes in 2 teaspoons (10ml) of oil, butter, or ghee until they are caramelized. Place the sweet potatoes in a serving bowl and drizzle the cilantro mint yogurt chutney on top. Sprinkle with the lemon juice, chaat masala, salt, and sev. Finally, garnish with pomegranate arils and fresh cilantro and serve. Add cilantro, mint leaves, green chilies, ginger, cumin powder, chaat masala, salt, pepper, lemon juice, sugar and yogurt to a blender and blend until the chutney is smooth. You can add a tablespoon (15ml) of water if necessary to help blend, but the chutney should be thick, not thin or watery. taste and adjust the seasonings if necessary. Store in the refrigerator in an airtight container for up to a week.